Over 150 people gather at the Lincoln Park Jewish Center in Yonkers for an evening dedicated to protecting the Mount of Olives. Over 150 people gathered at the Lincoln Park Jewish Center in Yonkers, New York several days ago, for an evening dedicated to the future of Har HaZeitim (Mount of Olives). Sponsored by International Committee for the Preservation of Har HaZeitim, the focus of the speakers' addresses was on eliciting a collective response regarding the escalating dangers to this most holy of burial sites where G-d fearing Jews from all over the world have traditionally asked to be buried. Rabbi Jay Schoulson of the Sons of Israel Synagogue in Long Island City, New York, spoke of the continued Arab desecrations of Har HaZeitim and the failure of the Israeli government to stop them. “The Arabs believe that the Jews' Messiah will come through the Gate of Mercy (Shaar HaRachamim), leading to the Temple Mount, so they closed up the gate and have created a cemetery there to prevent Elijah, who is a Cohen, from entering,” he explained. Cohanim, those Jews who descend from Moses' brother Aaron, are prohibited from being in the same area as the dead, for reasons of ritual purity. A profoundly shocking video presentation depicting the wanton desecration of graves on Har HaZeitim was shown. Images of garbage strewn everywhere drew gasps from audience members as the historical and religious significance of this ancient cemetery was told. 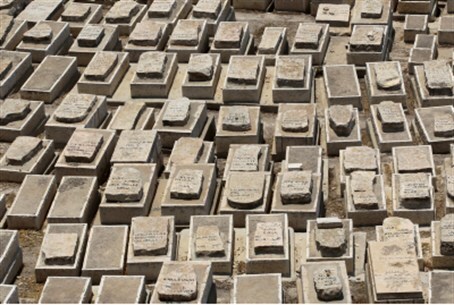 Dating back thousands of years, Har HaZeitim has over 150,000 graves and it was noted that an additional 50,000 graves and markers were destroyed by the Jordanians during the years of 1948 through 1967, in which head stones were used for latrines and building roads. Visitors to the Mount can see the destroyed tombstones next to restored ones, a painstaking job that has been aided by Bnei Akiva youth group volunteers. Famous Hassidic rabbis - including the Nadvorna Rebbe who died just two weeks ago - are in designated areas, as are Rabbi Avraham and Rabbi Tzvi Yehudah Kook, Rabbi Avraham Shapira, 1929 terror victims, Gush Katif transferred graves. Headstones describr people from the Diaspora whose bodies were brought to the site and new areas have been prepared along the sides of the Mount. Rabbi Rigoberto Vinas of the Lincoln Park Jewish Center displayed packets of soil from Har HaZeitim that are used to line the coffins of Jews being buried anywhere in the world. Menachem Lubinsky, the co-chairman of the International Committee for the Preservation of Har HaZeitim and co-sponsor of the evening along with his brother, Abe, spoke of Har HaZeitim as the burial place of their beloved parents. With palpable emotion, they described Arabs playing soccer there and being paid to trample on graves. Calling the State of Israel's failure to boldly respond to the destruction of Har HaZeitim a "national shame", Mr. Lubinsky said he had spoken with Knesset members who were ostensibly unaware of the pervasive desecrations. In an attempt to arouse public consciousness and to mobilize elected officials, the ICPHH has organized missions to Har HaZeitim. Led by Malcolm Hoenlein, chairman of the Conference of Major American Jewish Organizations, Reps Jerrold Nadler (D) and Eliot Engel (D) of New York attended the mission and personally experienced being pelted with stones by Arabs during their visit. Speaking of Har HaZeitim as the hallowed burial place for our prophets, rabbis, writers and simple Jews murdered in riots and buried in mass graves, Helen Freedman, executive director of Americans For A Safe Israel (AFSI), underscored the paramount importance of resisting efforts to relinquish holy sites in Israel to Arab hands. She then spoke directly to Rep. Eliot Engel when she castigated the Obama administration for "violating and circumventing" United States legal statutes which prohibit funding of UNESCO, as the organization has now accorded full recognition to the Palestinian Authority. Condemning UNESCO's "efforts to erase the history of the Jewish people in Israel and to Islamicize Israel's holy sites," Ms. Freedman said that President Obama "has already requested $79 million for UNESCO in the 2013 budget, along with an additional $40.5 million for "contingent requirements." Abe Lubinsky, Chairman of the ICPHH, took the present leadership in Israel to task for their indifference towards Har HaZeitim. "Prime Minister Netanyahu declared at the recent AIPAC conference that Jerusalem will never be divided again but he must come out of the closet. He must defend Har HaZeitim if he truly cares about an indivisible Jerusalem,” he said. Mr. Lubinsky told the gathering that while at Har HaZeitim he witnessed police chasing the Arab stone throwers, but, he added, "The Arabs know they won't be prosecuted and if they are detained, it's a revolving door, so they continue their attacks."